Are you looking for a contractor who can offer you a variety of decorative concrete techniques and applications? We do just that. We specialize in turning your existing concrete into unique decorative pieces. We offer acid and water based staining, micro toppings, overlays, spray and trowels and much more. We also offer a wide selection of epoxy coatings. 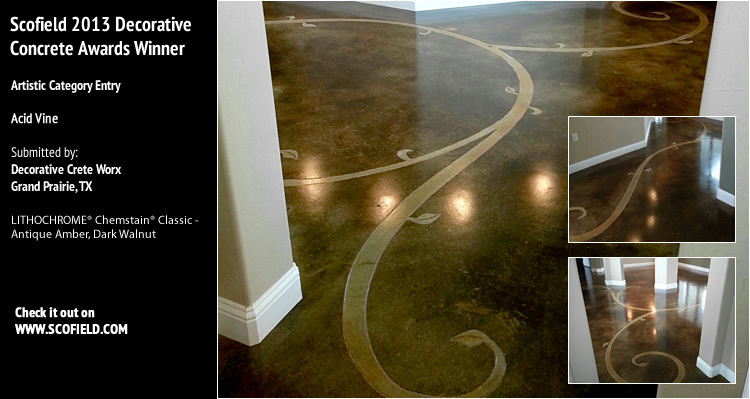 Serving the Dallas-Forth Worth metro areas, call today and let us meet your decorative concrete needs. Feel free to call anytime before 8 PM, seven days a week! Thank you for visiting Decorative Crete-Worx. We will provide you with any information you need in the most convenient manner possible. Please email us today if you have any questions or feel free to give us a call. Check out our lastest Testimonial!